Senior band students before the parade. From left to right Sebastian Romani Mendoza, Renet Chan, Salma Bezzat, Libby Taylor, and Dijana Masic. Photo courtesy of Nefira Masic. The Malden community gathered together to honor those who have served the United States at the annual Veteran Day Parade. 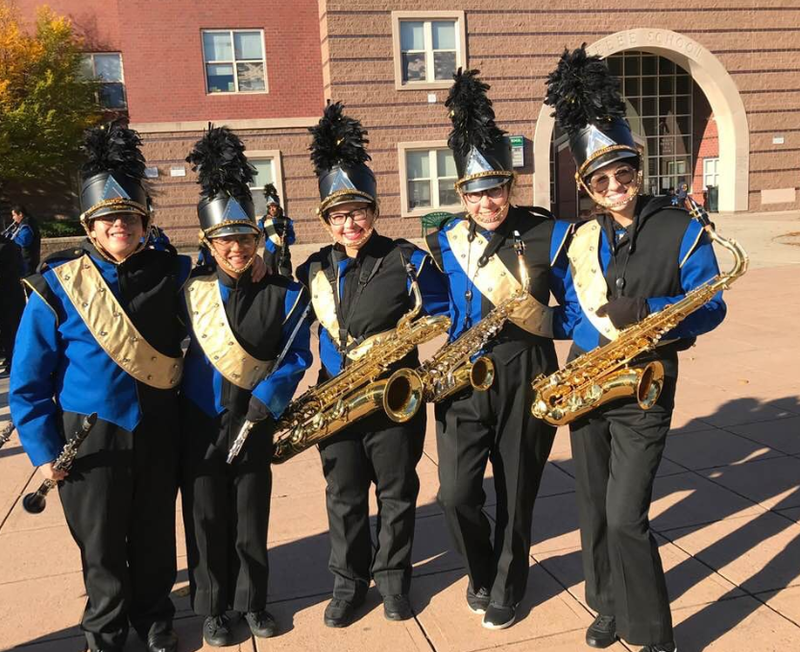 On November 11, 2018, groups like the Malden High Band, and the Malden Police Department participated in the parade. Everyone was instructed to meet at the Beebe School at 9:00. The different groups got into formation and began the route to Devir Park, where a ceremony was held after the parade. After everyone made their way over to Devir Park, the ceremony began, and the mayor alongside other elected city officials were introduced to the crowd. A majority of ceremony was spent discussing and unveiling the new monument which is now displayed at Devir Park. Christenson mentioned that the monument was a long term project that required time. He explained that the project took roughly 18 months and was officially finished the Friday before the parade. Malden High YMCA Leaders Club volunteered at the parade, offering help to the Band. Treasurer of the YMCA Leaders, Angela Truong thought that it was a good idea to have this parade as an option for volunteers to “honor the brave soldiers” who served for the United States. Volunteers helped carry fake guns, banners, and flags leading the band, while others trailed behind the band and marched along with them. Sophomore, Suiyenah Chen was one of the many volunteers at the parade for YMCA Leaders. She expressed how she had a great time marching behind the band “because [they] looked and sounded good.” Chen also explained that she is very surprised by the band’s ability to “play [their] instrument while walking in the cold weather.” She also mentioned that she “personally [likes] volunteering and helping people out if they need it,” which is why she decided to attend the parade. Music Teacher, Erin O’Brien-Mazza stated that the band played two songs, “Washington Post and Taps.” She explained that “Washington Post [was] a very old traditional march by Sousa.” She also mentioned that “it is the song [the band] play for all of the patriotic parades. “Taps is the song that every military event has played to recognize the soldiers who have died serving,” the United States, said O’Brien-Mazza. Senior, Jesaias Benitez, sophomore, Wilson Chau, and freshman, Shai Cohen performed “Taps” during the ceremony. Flutist, Alissa Schopp expressed that wind ensemble “did not practice the [songs] for very long because [they] have played it,” in the past. She mentions that “concert band practiced in class more often,” due to the fact that the class consists of many freshman “who have never heard [the songs] before.” Schopp thinks that “parades are difficult because [it is] a lot of walking and it takes focus to play and walk at the same time,” but she appreciates the tradition. Malden Veterans have become a significant asset to the city, and hope to revisit the monument in the future years.